I am happy and excited to share a new site that I’ve just put up. It is an online gallery of fine art prints https://tonywu.art that I’ve had on my to-do list for years. It feels wonderful to bring the site to life. 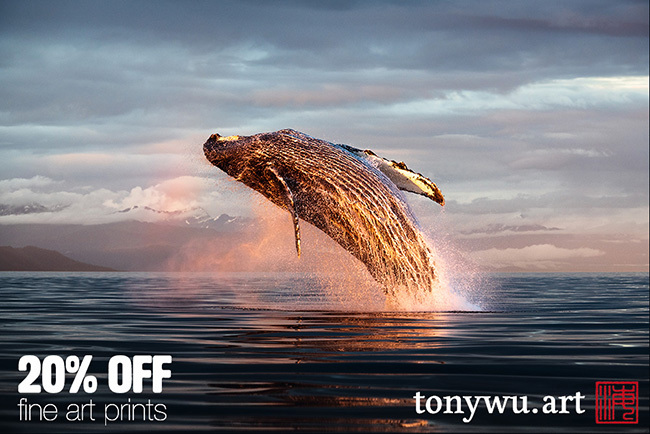 To start, I’ve prepared 27 prints of some of my favorite images of humpback whales. If you take a look at the site, you’ll see that the images are divided into two collections—Wall Art and Collector’s Editions—with a range of sizes and prices. And to mark the occasion (of my finally getting off my rear and putting together this site) as well as the festive season, I am offering a 20% discount on all prints. To get the discount, use the code SAVE20 at checkout. Woohoo! 20% off all prints through 31 December! If you visit the site, you’ll also see that I’m giving away a free print to a lucky person on my newsletter mailing list. All you have to do is sign-up, and I’ll have a third person select a winner at random on 1 January 2019. I am running this campaign/ promotion because I have decided that I will be writing and communicating more via email in 2019. There are a host of reasons for this, but in short, I want to get back to writing more thoughtful pieces and focus my communication with people who actually read and think, rather than just hit a Like button. I will send out one, maximum two emails a month (I can’t handle more than that), so don’t worry about being inundated. The emails will comprise some mix of short essays, photos, trip information, and first looks at new prints. My first couple of newsletters in this new format have already gone out. I plan to do one more this year, later in December, with the main topic being my favorite photos of 2018. Please visit my new site and/ or sign-up here. PS: For clarity, if you receive my blog posts by email, you are not necessarily on my newsletter list. They are different. If you're confused, send me a message.